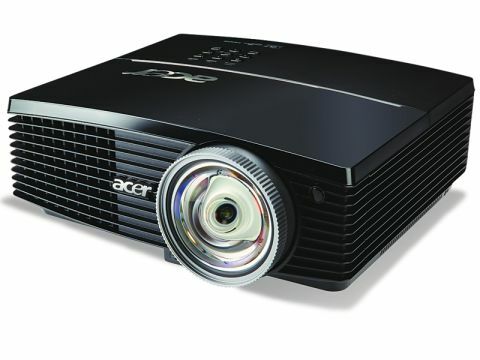 The Acer S5200 data projector stands out for two reasons. First is its size. At 3.5kg, it's no small fry, so is not intended for use anywhere other than an office or home environment. However, its hulking size does mean you'll find a comprehensive array of ports on the back, including network options. It's a handsome device, but you'll need to handle the lens with care, as it protrudes from the front of the case. The second reason the S5200 stands out is that, with a brightness rating of 3000 ANSI lumens, it's powerful. Even when it is dropped down into Eco-mode – which offers a slightly less bright image – the projector still delivers great image quality. There are nine control buttons on the top of the S5200, offering the standard functionality. This is mirrored by the supplied remote control, which is large and easy to use. Sadly, while the menu controls are comprehensive, they are spread out across a number of pages, so navigating the menus to get the best out of the projector does take a little time. Thankfully, the addition of a dedicated Acer Empowering button allows you to quickly change usage modes, making it somewhat easier to get started. With a maximum resolution of 1600 x 1200 pixels and the addition of an HDMI port, you'll be able to view HD content with ease. Like the Vivitek in this group this projector is also 3D ready, so can be used with any laptop with a 3D accelerated graphics card. We also like the fact that you can easily change from a 4:3 aspect ratio to a widescreen 16:9, so switching from presentation to movie mode is quick and easy, for example. The Acer S5200 delivers a great deal at a good price. While it lacks mobility and seems a little too component-rich for home use, it would make a great choice for a busy school or office.